Season’s Greetings! And best wishes for the New Year. Welcome to the first edition of the JWK Safaris newsletter for 2018. We will soon be attending the Safari Club International Convention from 31 January to 3 February in Las Vegas in booth #434. If you are around and attending the show, please pop by and come and say Hi. Jono and Adriaan will be manning the SCI booth while Carl is is off to the European shows in Germany and Spain. Our 2018 Brochure has been sent to the press and distributed shortly. However, we know some of you are to eager to wait and can download it on the following link: CLICK HERE to view our 2018 Brochure. Over in the Matetsi ECA Safari Area, PH Talmage Alexander guided a client on this buffalo and sable hunt. Matetsi ECA is around the 290,000 hectare mark and is truly one of the last free-range, unfenced hunting destinations left that offer clients the experience of a life time and the longing to return as soon as possible. Onto the recent hunts in the Gonarezhou Safari Areas with PH Nixon Dzingai. A great croc and hippo hunted on the river banks. River hunts for hippo are always exciting due to the fact that most hippos are hunted on dry land in and around the Lowveld River system. 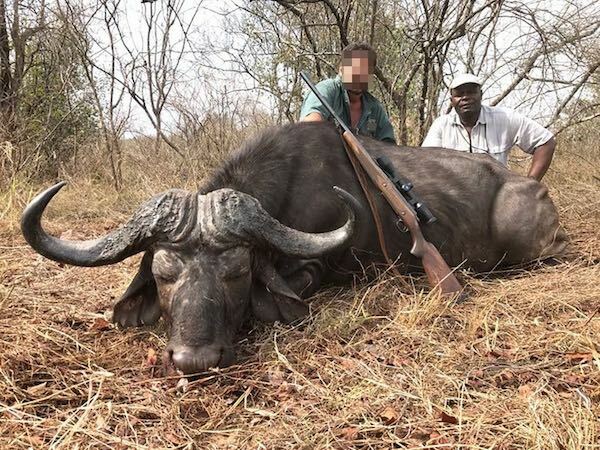 This trophy 44 inch buffalo bull was hunted in the Malipati Safari Area of Gonarezhou. 750 USD road transfer fee from Harare to Gonarezhou including the return trip (air charters available on request). CLICK HERE to view our Gonarezhou Pricelist for the 2018 season. Some recent news out of Gonarezhou National Park. Parks Rangers found a 132 pounder pick-up in the National Park. Yes, that is not a typo, 132lb pick-up. The Gonarezhou Safari areas are the perfect place/best place to hunt for trophy elephant bulls and trophy buffalo bulls. During the last 5 years, Carl booked clients whom have hunted two bulls over 100 pounds, one of them was 105 pounds, the next was 122 pounds. 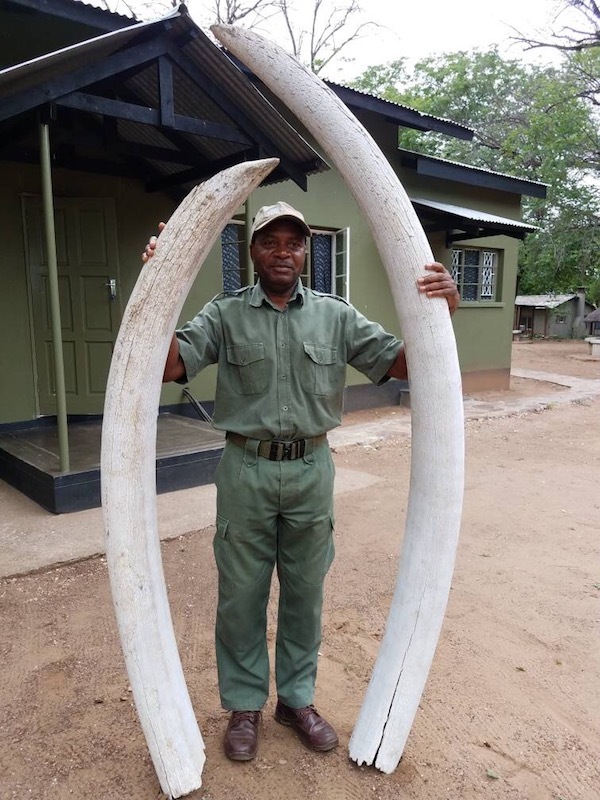 This pick-up bull was not hunted, the tusks were found by Parks Rangers inside the Park while out on foot patrol. This bull surely died of old age but, not before passing on his gene. 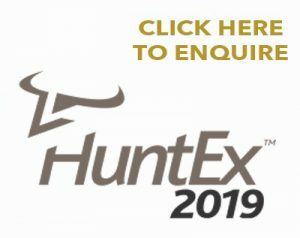 We are very pleased and proud to be able to offer you these exclusive hunts that are without doubt amongst the best hunting areas in Africa today and the best of the best areas that Zimbabwe and South Africa have to offer. All of these concessions: Matetsi ECA, Malipati Safari Area (Gonarezhou), Naivaisha Safari Area (Gonarezhou), Sengwe 1 and 2 (Gonarezhou), Limpopo Serengeti (RSA), Free State Philippolis Lodge (RSA) are all the best of the best hunting areas in today’s Africa. To be able to offer these concessions is huge honour for us and has come at the cost of many years of hard work. These are not hunts that are freely available, these are as we mentioned before, the best of the best. To the old and new faces who booked their next African hunt with JWK Safaris – Thank you for your support and welcome on board folks – Prepare yourselves for the adventure of a lifetime. Feel free to contact us on info@jwksafaris.com if you are interested in booking your next African Hunting Safari. We can also be reached on +27 11 083 9997. Thanks for taking the time to read our newsletter and pass it onto your hunting friends.